Chinese President Xi Jinping will soon pay his first state visit to the United States. The big question is: What can he accomplish during this visit? Shortly after assuming office, Xi accepted US President Barack Obama's invitation for an informal visit to the US. 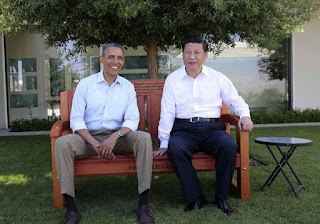 Xi must have thought that getting to know Obama on a personal level would be an important step to improve bilateral ties. In fact, from the outset, Xi has made a closer working relationship with the US one of his highest priorities. When Obama visited Beijing last November, he and Xi made two surprising announcements: to control greenhouse gas (GHG) emissions and to issue 10-year, multiple-entry visas to citizens of the other country. The multiple-entry visa has already resulted in a significant increase of Chinese tourists to the US, substantially boosting the American economy. And reducing GHG emissions has been one of Obama's major initiatives that he could now check off as a bilateral accomplishment. Obama got tangible results from his visit to China and should feel good about it, and the tangible outcomes Xi will get out of his visit to the US is very much up to Obama, too. During Obama's administration, the US' relationship with China has been more down than up. Every "100,000 Strong" initiative to encourage American students to study in China has seen as many befuddled gestures against improving bilateral ties. One of the strangest was to vocally oppose the formation of the Asian Infrastructure Investment Bank. For that, Obama got a well-deserved rebuff from the international community that overrode his concerns. For most of his term, Obama's foreign policy followed the disastrous course of his predecessor. Of late, however, Obama appears to be taking more independent foreign policy measures (for example, those on Cuba and Iran), according to what he thinks is right, perhaps with an eye to building his legacy. Now, Xi's visit offers Obama an opportunity to make a course correction in the US' most important foreign relations factor. Surely, leaving the US' ties with China worse off despite the efforts of the seven presidents before him will tarnish Obama's legacy. So, Obama will do good to take the following measures in order to improve US-China ties. First, Obama should stop treating China as an adversary of the US. To that end, he should order the military to stop surveillance flights off the coast of China. By doing so, he won't be giving up anything that can't be obtained by satellite. The main effect of those flights has been as a psychological irritant, and the public relations impact of stopping them would be huge - a small US gesture that could have a huge effect on this. Second, Obama should offer to help Xi's anti-corruption campaign by making it difficult for corrupt Chinese officials to hide in the US. In so doing, Obama would render valuable help essential for Xi to complete the most important task on his agenda. Also, the move would place the US on the moral high ground, as he would be able to tell the world that the US does not coddle criminals and fugitives from other countries. Third, Obama should take the opportunity to reverse his awful and awkward position relative to Xi's pet projects: the AIIB and the Belt and Road Initiative, and pledge support and willingness to work with China in Asia. It is likely that Xi is not prepared for such offers from Obama, but surely the US president's gesture would be highly appreciated. The above three steps are easy for Obama to take and can contribute a lot to bringing the two countries closer. There is yet a fourth measure Obama could put on the table with chutzpah and panache during his meeting with Xi, and that would be a proposal to work together to resolve the Korean Peninsula nuclear issue. Obama knows Republic of Korea President Park Geun-hye was in Beijing on Thursday to attend the events to mark the 70th anniversary of the end of World War II, and Democratic People's Republic of Korea top leader Kim Jong-un was not. Arguably, China gets along with the ROK as well as the US. The three parties, sitting on the same side of the table, can begin a serious discussion on how best to resolve the Korean Peninsula nuclear issue. For sure, it would take serious efforts from all the parties. But Obama should seize a statesman's initiative by proposing to Xi that the three parties begin the process. Solving the Korean Peninsula conundrum would be a spectacular exclamation mark of his legacy, an accomplishment that has eluded his predecessors. His mere willingness to suggest taking on a risky and delicate project would build mutual trust with Xi and could lead to successful collaboration on many other fronts. The author is a retired business consultant who used to regularly visit Hong Kong and the Chinese mainland. He is also a former director of New America Media.